A huge explosion shook most of Tehran on Saturday. At first it was said a CNG fuel depot had exploded but finally the official confirmation was the explosion had happened at the Modares base in Bidganeh village 50 km SW of Tehran. Even though the explosion was well outside Tehran, almost all residents of Tehran, even to the East of the city, said they either heard or felt its shock waves. There have been many speculations as to the real cause of the explosion, one common rumour has been that it was the Israelis who had attacked and destroyed the base, because it stored Shahab 3 missiles. Whatever the real cause of the explosion, I thought this poster by a group calling itself the Cyber Soldiers of the Supreme Leader was worth posting on my blog. 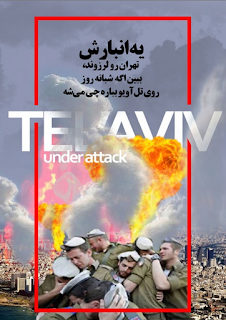 The caption reads "Just one depot shook all of Tehran, See what will happen if it falls day and night on Tel-Aviv"
Mmmm! Gotta laugh! Apparently they were trying to get a nuclear warhead onto the Shahab 3 but messed it up! But why not blame the Israelis? They blame them for everything, so it is no surprise! I am guessing how long it will take to Iran to attack Israel. With news like this one, it seems inevitable.